A young man who takes delight in stealing domestic animals in and around Ekwulobia,the Aguata Local government headquarters has been caught by the eagle eyed Umuchiana Village Vigilante group. 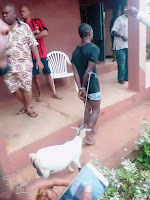 The young man in his mid twenties, a non indigene of the town confessed stealing a pregnant goat in Okpo village of the town in the wee hours of yesterday and was allegedly heading to the home of his accomplice buyer when he was nabbed. 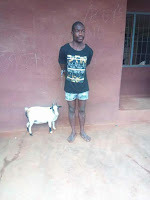 The suspect whose name Ekwulobia Urban-News could not scoop before going to the press was paraded at the Umuchiana village hall this morning amid jeers from bystanders. Reports said that after removing the animal from the tether at the home of its owner,he tied it in a motorcycle and headed from Ezinifite road down to Umuchiana before the security men from Umuchiana village caught him in a sentry post along COC Ezenwa road.